In 1686, Halley published the second part of the results from his St. Helena expedition. This was a paper and chart on trade winds and monsoons. He thought solar heating was because of atmospheric motions. He also established the relationship between barometric pressure and height above sea level. His charts were an advance in how to display information visually. 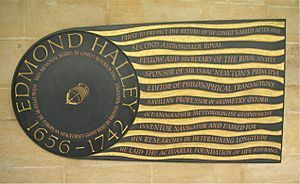 Halley also persuaded Sir Isaac Newton to publish a book about his discovery of gravity. Edmond Halley Facts for Kids. Kiddle Encyclopedia.